In KC, it’s now reported that Justin Houston wanted a second opinion on his hyper-extended knee and visited Dr. James Andrews to see if there is more to an injury that’s keeping the record setting pass rusher out longer than expected. In Denver, Quarterback Peyton Manning is back on the practice field… as the scout team quarterback. Can you imagine how strange that felt for Brock Osweiler, who will start this week as Manning is inactive, and the rest of the Broncos? It’s the first time Manning has every been asked to practice as a scout team QB, a job that’s basically running that week’s opponent’s offense for the benefit of your team’s defense. Amazing. Still, I get the feeling we will see Manning and Houston on the field again this year given the important nature of upcoming games and the playoffs. There’s just no way you don’t play a healthy Manning if he’s ready to go. The Chiefs are rolling, winners of seven straight. It wasn’t pretty against the Chargers last week in the rain, but it wasn’t the weather that caused the Chiefs offense problems. It was playing a division foe for a second time. A team with nothing to lose. The good news is the Chiefs are literally at a point where they don’t have to play complete games to win. They have played plenty of complete games during a stretch where their average victory is 29-12, but this wasn’t’ one of them. It was all about the defense and sometimes that’s good enough. It was capped by an amazing stop in the end zone on the last play of the game after the defense had been on the field for 19 plays and five minutes. This defense overcame early season issues with injuries, injury recoveries and the suspension of Cornerback Sean Smith. That’s the time KC was at it’s worst starting 1-5. 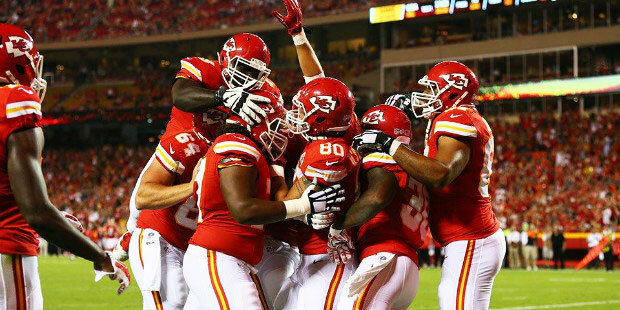 But with the emergence of players like Jaye Howard and now Dee Ford, this defense has improved a ton. It’s clear now there are enough pass rushers in KC to do much better than just get by until Houston returns. So here’s where we are. The Chiefs, Steelers and Jets are all 8-5 and, as we’ve stressed many times, KC holds the tiebreakers. The Jets are at Dallas and Pittsburgh hosts Denver. If you want to win the division, you want Pittsburgh to win even though that’s a negative for your wildcard chances and seeding. It’s the time of year where it can be confusing which team to root for. The Steelers are playing much better than Denver right now and along with KC, Carolina and Seattle, they’re playing like champions. Winning the division would be amazing and the Chiefs would play at home, but a road game as a wildcard could be even tastier. Houston, Indy or Jacksonville would be the best option but if Andrew Luck returns and plays at a high level, Indy could be hard to beat. There’s still kind of a sense this Chiefs team will have something bad happen as they try to close this out and then make a playoff run. It’s the same feeling we used to have about the Royals. Used to have. See, it can change with the blink of an eye and the Chiefs are playing well and sitting in a good spot. KC has the 4th best scoring defense and the 8th best scoring offense. They sack the quarterback. They force turnover and don’t cough it up themselves. These are the absolute keys to winning in the NFL. That, and stepping up and making a play with the game on the line. The Chiefs have been winning lopsided games which is why it was so great to see them step up at the end of the game last week. Sunday at Baltimore, the Ravens makeshift offense will feature Jimmy Clausen and/or Ryan Mallett. All the Chiefs have to do in this one is not turn it over and give Baltimore a short field and KC flies home for the final time in the regular season with a win in their pocket. 31-13 Chiefs. Denver loses. Race is on!